Sales Leaders were gathered around the conference table to debrief the progress of each respective team’s reps in The Challenger Sale. There were some great successes shared, with one story of a Relationship Builder who was consistently ranked last, rising to #1 for the last 7 consecutive months. All because she changed her behaviors. It wasn’t that the sales reps struggling with the Challenger implementation were blatantly resistant to change. They just weren’t sure it was necessary. Their performance was relatively strong, with nearly all achieving quota. Yet there were points in their daily discussions with prospects that were not effective. Their leaders knew it and they knew it. Reps would approach their respective sales leader with the problem…or vice versa. The leaders would then point to the corresponding Challenger behavior that would address the problem, then coach to the behavior. Seems reasonable, right? Wrong! We were circumventing the process in order to speed up coaching and performance. They had a known problem. We had the solution. The Challenger Sale! At the heart of the matter was that the reps with their very legitimate problems, were hearing the ‘solution’ from their leaders. In the Challenger choreography, this is the equivalent of going straight from Warmer to Our Solution. See my previous post on the consequences of doing so. When we don’t adjust our prospect’s thinking (or in this case, our reps), and expose the problems with the status quo, we fail to ripen their appetite for a new way. For these reasons, the Reframe followed by Rational Drowning into Emotional Impact are critical, especially when teaching new behaviors. When coaching, don’t assume you can jump to the solution because reps have sufficient information. What is not needed is more information. What is needed is a different way of thinking about their problems. Therefore, always follow the choreography. The choreography’s brilliance is that it uncovers and exposes faulty beliefs. Beliefs that lead to complacency in the Status Quo zone. Take the time to do it right by setting a foundation for a reason for change. Then lead them as a Challenger would do. As a leader, you will benefit by reinforcing your Challenger behaviors (not theories). Your reps will benefit from seeing it in action and the effectiveness in bringing about change. What began 100 years ago, with President Woodrow Wilson signing into law a National Day to honor mothers, has come to represent something of a flawed model for truly honoring those we care about. In today’s culture, where ‘busyness’ rules the day, we can quickly and easily fall into familiar patterns that look an awful lot like day-to-day survival as we work through our to-do lists. By the time Mother’s Day rolls around, the scramble to ‘show Mom how much you love her’ can simply become another checklist item. As leaders, we can fall into these same patterns. Many years ago, working with one of my leaders on this very topic, I had observed an unhealthy tension between the leader (Ron) and his staff members. With one particular staff member (Robbie), it was especially pronounced. I met with Robbie and asked him why he was so angry with Ron. He proceeded to describe the dysfunction between Ron and the whole staff. One of the examples Robbie cited was that when Ron would walk in to work every morning, he would walk right past every one of his co-workers without saying a word, much less “good morning.” Hearing these examples, I sat the two of them down to talk about these behaviors in order to bring insight to Ron, and facilitate a healthier work environment. As Robbie shared his example with Ron about not saying “good morning” when he walked in, Ron wrote a note on his paper, saying aloud as he wrote…”Say good morning to Robbie when I walk in.” Ron’s tone was clearly patronizing. Robbie hung his head in disappointment. Ron was terminated shortly thereafter for a variety of reasons, including his lack of value for people. He relegated respect and honor to a checklist item. We hear stories like the one I just described, and we are appalled. Yet if we look in the mirror, how often do our actions reflect aspects of this very same behavior. For example, if we are marking our calendars in Outlook with reminders to ‘get Mom a card’ are we truly honoring her? I am not advocating doing away with Mother’s Day. I just believe that we have an opportunity to ‘honor’ differently. If we truly want to honor her, we make it a priority and demonstrate our love and honor through our regular actions. And so it goes with those we lead. It is easy for us to say we value our staff, but do our daily actions reinforce that our actions match our words? If not, let’s change that. 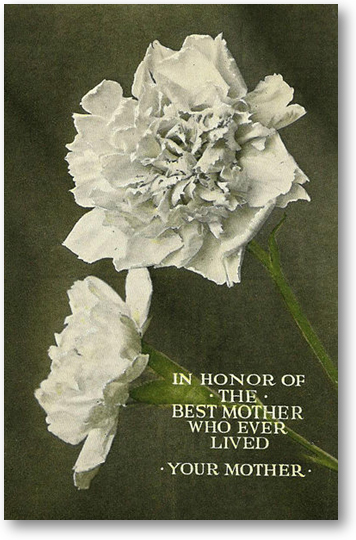 Let’s use this Mother’s Day, not as an annual reminder of when to ‘honor’ mom, but rather as the beginning of how we will honor those we love and care about each and every day. Challenger Sale: Do you Reframe in 3-D? Do you remember when the Magic Eye pictures were all the rage back in the 90’s? For those unfamiliar with Magic Eye artwork, a 3-D image was embedded into a picture that otherwise appeared to be nothing more than colorful, repeating patterns. However, to the trained eye, when looked at in a different way, the 2-dimensional image would suddenly, and magically, ‘pop’ into a stunning 3-dimensional reality right before your very eyes. 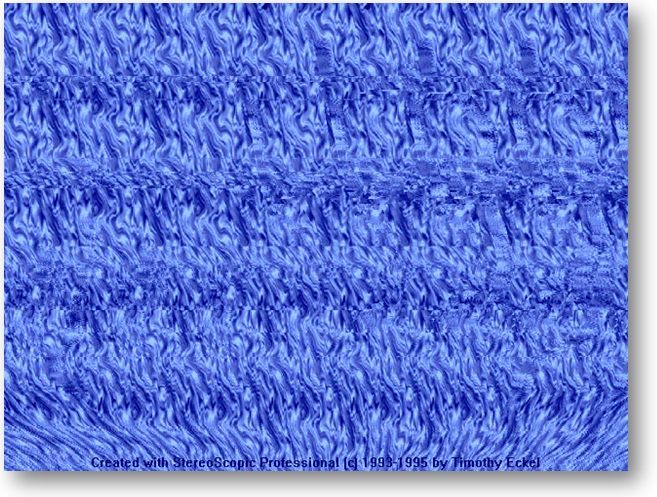 There were two camps with these Magic Eye pictures – Those that could see the images and those that couldn’t. For those in the latter camp, they found it difficult…frustrating. In fact, it reminds me of how prospects often feel when Reframed to see a radically different picture of their own circumstances. They can really struggle at this stage…which can be very good! When considering Magic Eye art and comparing to the Reframe, there are some great parallels that may bring clarity to your understanding of what the Reframe does and how it feels to your prospect when they finally see what you want them to see. But first, a lesson on how to see the picture in this Magic Eye image above. There are two prescribed methods for seeing the picture in 3-D (i.e., A clipper ship in this case), although knowing you are looking for a clipper ship will not help as much as you think. Regardless of the method you choose, start by clicking the picture to enlarge and open in a separate tab of your browser. Method 1: Relax your eyes and get real close to the screen as you stare at the picture. Don’t try to focus on the picture, but simply gaze through it in the same way that you do when you daydream. Begin to back away from the picture slowly after 5-10 seconds. You should start to notice your eyes feeling almost as if they are crossed as you move back, because the image will be out of focus. Once you are about 12″ away from your monitor, the hope is that the image will snap into view for you. If not, be patient. Method 2: This is the method I prefer. Position yourself approximately 12″ away from the image and look through the image, rather than at the image. For example, if there is a wall directly behind your monitor, look upon the image as if you were able to see through it like a window to the wall. This will relax your eyes and allow the magic to happen. Give it 5-10 seconds without blinking. One trick that helps me recognize when the image is about to snap into place is I slightly move my head from side to side (i.e., just an inch or two). If the image is still appearing flat, like a 2-D image, your side to side motion will reveal nothing. However, if your lateral movement starts to show some depth in the picture, it is about to happen for you. For those that experienced the mysteries of the Magic Eye artwork for the first time, congratulations! It is truly amazing! For those that still can’t see it, practice. Most people fail to see the image because their natural tendency is to focus on the detail of the flat image itself. It will come once you start to learn the skill of looking through the picture. What I love about this illustration of the Reframe is how analogous it is to conversations with prospects. From our perspective, having been trained for what to look for in our prospect’s circumstances, we see things more clearly…more deeply than they are able to see. We may even be inclined to get frustrated ourselves because what is so clear and obvious to us, our prospects just can’t see in the same way. It is as if they are staring at the surface of the Magic Eye picture and all they can see are repeating patterns. But seeing the patterns alone will not move them off the status quo. It is deeper than that. See the similarities to a Reframe? One Final Note about Reframes…. Being able to properly Reframe a customer is important, but it is not the goal. It is the entry point to getting deeper in conversations. If we don’t practice discipline in this area and recognize that fact, we can take a perfectly great insight and not move any further through the choreography. Focusing on the insight alone is like staring at the surface of the Magic Eye picture. It is 2-D. Instead, look at the Reframe as looking through one stage to another…from how they have inaccurately seen their picture (Warmer) to the consequences of not changing their picture (Rational Drowning). Does anyone remember your corporate vision? After laboring with your leadership team to set a compelling vision for 2013, the chances are, your staff won’t even remember it only 30 days into the new year. Ask 3 staff members about your current vision. Be prepared for the results you will likely find. For those that found that all three remembered the vision with clarity, you are part of a rare few. This would suggest that you already know the success was not due to a catchy, compelling headline, nor was it because you were so engaging in your delivery of the vision. Both may have been true, but were not the reason. Most, on the other hand, fell into the broader category of the ‘forgotten vision.’ Following are a few steps to take before it’s too late and your staff forgets you even spoke about the vision. Before doing so, let’s make sure the reasons are clear for why this is often forgotten so soon after being delivered. Do any of those reasons look or sound familiar to you? What is interesting is that both, in the workshop and in working with other leaders in this area, is that most believe they need help with vision casting, believing that they just needed a better story or a better way to tell the story. While I do give some guidance and attention to that part in my workshops, my primary emphasis is on vision execution. When you reflect upon the vision setting exercises you have been engaged with, you are likely to remember the sense of relief you had when you finally completed the vision. Most see this process as putting in the hard work up front whereas all that is left is to deliver the vision to the team and expect the results. I have significantly oversimplified how most actually go about this, but the truth of the matter is that people too often place inappropriate emphasis on the front end of vision casting and little to no work in executing the vision. The truth is that the vision casting is the easiest part of the process. The harder part is in distilling the vision down into executable actions that connect directly to each team member’s behaviors. The second part is in having specific, measurable evidence of where the vision is being carried out for each staff member to call and reinforce further behaviors. Here is a closer look at these two steps. Step 1: Connect vision to behaviors. 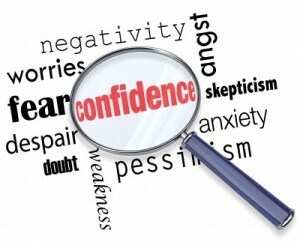 As a leader, credibility is one of the most important attributes you have, and should not be taken lightly. When it comes to making your vision a reality, failure to work through your leadership team to connect specific behaviors to the vision not only sets the vision on a course to fail, but erodes your credibility altogether. Therefore, make the time and make the connections. 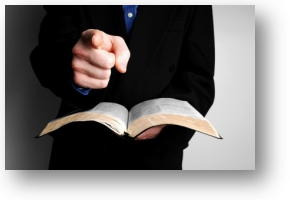 I recommend each leader meets with their direct reports one-on-one to maximize impact. The task itself is not difficult, but rather the difficulty is in committing to the time investment necessary to make this step effective. Don’t bail out on this one. The stakes are too high. Step 2: Reinforce contributing behaviors. While Step 1 is a great start towards your aligning your staff to the overall vision, assuming it meets standard vision protocol and resonates with staff members, that alone will not be enough. To keep the team on track and to change behaviors leading to a successful progression towards the vision, they will need consistent feedback and reinforcement of how their actions are contributing. Therefore, after having invested the time to connect the vision to individual behaviors, the second critical step is to reinforce behaviors daily, weekly and monthly as you see evidence of the behaviors that lead to success. As the leader, you know the pressures you experience to get things done with fewer resources. Your staff feels these same pressures, just in differing degrees. Therefore, if you feel that you don’t have time to take these steps to carry out the vision, how likely is it that your staff will naturally commit to carrying out the vision along with their other responsibilities? They won’t! Without you taking these aforementioned steps, they will simply see the vision as an interruption to getting their regular work done. Their everyday responsibilities [as they define them] will win out every time. That is, unless you define and connect the two, then consistently reinforce those behaviors. Is your vision worth the investment? January 27, 2013 marks the first time an athlete has ever achieved a six-peat…six consecutive gold medal performances…in the winter X Games. 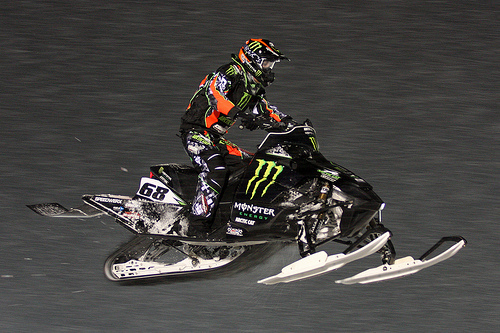 Tucker Hibbert did so in remarkable fashion in the Snowmobile Sno-Cross event Sunday afternoon. It wasn’t his talent alone that won the finals for him. The X Game analysts were quick to point out that this was one of the most experienced and capable field of champions they have ever seen. What they did point to as the differentiator, rightfully so, was his preparation. You see, in between the semi-finals and finals, Tucker chose to spend his time walking the course to evaluate how the snow conditions had changed. He also spent time evaluating where the shadows were falling on the course along with identifying the intended lines he would take. It turns out that he was the only competitor that did so. Assimilating all of that information resulted in his selection of starting lane (afforded to him because of his semi-final finish), which was counter-intuitive to where most others wanted to start from. By the time they all completed the first lap, Tucker was in the lead and on his game plan. More than half way through the race, conditions continued to change as the shadows continued to shift and the snow conditions on the track worsened. Lap 9, Tucker was jolted by hitting a rough patch in his originally chosen line. He adjusted his line to his plan B approach by the time he reached that same rough section on lap 10 and continued to put distance between himself and the second place competitor. Six laps later, he had finished the race creating a phenomenal 13 seconds of distance between his next closest competitor. Tucker prepared in a way that his competitors failed to do. In fact, all things being equal, each of the competitors had the opportunity to win with similar experience, equipment and conditions. Yet, it came down to Tucker’s preparation that enabled him to respond asymmetrically to an otherwise, equal playing field. Tucker clearly had an advantage over his competition. An advantage also available to each of his competitors, but they declined, instead relying upon their own experience to see them through. For leaders, you can certainly attest to the pressure to perform while leading your team to do the same. With the level of responsibilities a leader typically carries, the tendency can be to approach business as just another day. merely showing up and reacting to whatever the next day has in store. This is certainly no way to lead, and definitely not a recipe for intentional, predictable and repeatable success. What do today’s actions reflect about your preparation to lead your team to success? Specifically, what have you done today to ensure your team’s success? Does your to-do list focus more on tasks than it does in leading your team to success? 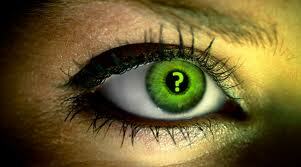 If these questions have exposed some vulnerabilities in your daily approach, you are not alone. Be encouraged as you have taken the first step to acknowledge complacency. Complacency threatens all of us if we don’t intentionally disrupt our own status quo. Here are three steps to help you prepare differently, much like Tucker had done for his record performance. After all, wouldn’t we all like to succeed in intentional, predictable, repeatable ways as Tucker did? Intentionality. Evaluating ever-changing conditions in the business environment requires being prepared for anything. This includes anticipating problems before they happen, and even planning how you will respond to the unanticipated. To have this ability, the leader will need to take intentional steps and set aside time to address these areas. Action: Schedule this into your calendar to address consistently and frequently. This needs to become an habitual routine. Predictability. After you begin intentionally looking for ways to be better prepared, you will begin to see patterns. These patterns often come in the forms of team member behavior that leads to lesser performance, complacent reactions of competitors, or even economic rhythms that you can predict and address now that you see them. Action: Practice predicting outcomes privately. Start developing this capability and pay attention to predictions and what surprised you along the way before you go public. Repeatability. When you have devoted the time to be intentional, others begin to notice your seemingly innate ability to predict outcomes and that you are well-prepared, you will find that repeatable successes happen with much greater frequency. This makes you an invaluable asset and resource to your team and your organization. Action: Look for ways to repeat your success without relying on repeating the same exact actions. Life usually doesn’t work that way. But for the effective leader that knows how to succeed repeatedly, do as Babe Ruth did and call your shots before they happen. Then make good on it by developing your intentionality and predictability muscles. The most meaningful things in life take time to develop. Effective leadership is one of those meaningful areas worthy of pursuing. But it’s up to you. What will you choose? What will you do differently today, that will make a noticeable difference in what you and your teams do tomorrow? 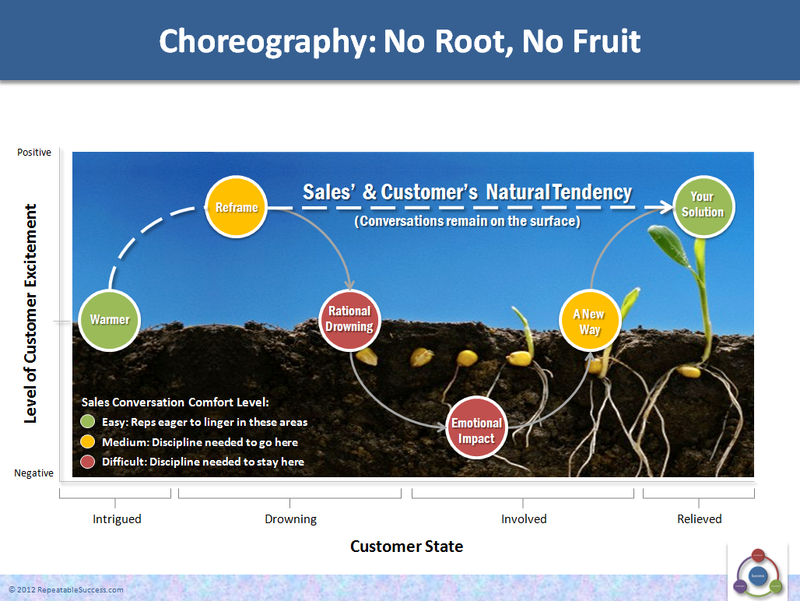 A cursory review of what each stage of the choreography is intended to accomplish is largely unsurprising, and in five of the six stages, looks similar to many selling systems* out there. There is more than meets the eye, especially as the real point of differentiation tends to hinge on the second stage with the Reframe. Being able to Reframe, or share an insight in a way that the prospect hasn’t thought of or considered before, is paramount to moving successfully through the rest of the choreography. If you are looking to build proficiency in the way your sales and marketing staff successfully communicates reframes, perhaps the exercises we had done in weekly team meetings will be helpful to you in working with your teams. Getting people to think differently about something in ways they have never done before is not an easy task, especially for those that had not been thinking that way. Therefore, we were looking to develop and cultivate competencies in this specific area so our team could recognize unique points of view and deliver them without the feeling of “starting from scratch,” as some had described the process. Following is an exercise I led the teams through to not just teach them what to say, but rather teach them how to think to create effective reframes. Each Team Leader would bring a mystery grab bag of everyday items to the meeting. The team would pair up and grab an item from the bag. Representative items included things like scissors, a whiteboard eraser, aspirin, etc. In one of the exercises, the teams were tasked with reframing the same item – a wire coat hanger. Some groups went down the path of calling out the many uses for a wire coat hanger (e.g., “perfect for unlocking car doors,” which is the stereotypical, product-centric, ‘lead WITH’ approach). We debriefed and they understood where they made their mistake. Teaching Point: Homeowners are often short on closet space and fail to realize the main culprits of closet space are plastic and wooden hangers which are 5-10 times the width of wire coat hangers. Warmer: “We often hear from many of our customers that closet space at home is at a premium as they cite that they have too many clothes and their closets are too small. Is this something you experience as well? [They validate with the customer, so as not to assume a problem they don’t have]. The customer/prospect is invited to share the specific details of their problems. Reframe: “We hear that a lot. In fact I hear solutions ranging from changing out their clothes for each season to complete remodels to build larger closets. What is interesting is that when you consider the #1 choice of hangers for most people, it is the plastic coat hanger. Have you ever considered the fact that a plastic hanger is 7x thicker than a wire coat hanger? Perhaps a different question is why your local dry cleaners don’t use plastic coat hangers? While many believe it is due to cost, their reason is that they would need to build a facility 1.3x larger to house the same number of articles of clothing that they currently house by using a wire coat hanger. We call the process batting practice as it is a way of warming up before sales calls. This process has been fruitful with our teams as they have started to recognize and develop reframes on the fly to get people to see things differently all throughout the day. In fact, for several, they have begun to pass along affirmations to their colleagues in the form of, “I never thought of it that way before,” when they have successfully reframed whatever the point was in which they were speaking. They are having fun with the process and the audience, be it customer, prospect, family member or friend, benefits as a result of the new insight. Following is a resource you can use with your teams to practice Reframes of common everyday objects. Share your insights on exercises you have used or are using with your teams.